We are service professionals! 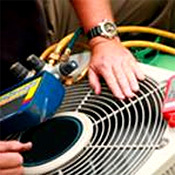 As licensed contractors and specialists in the field of heating and air conditioning, we have the tools, the equipment, and the experience to keep your equipment running smoothly all year long. If it is emergency service that you need, we are available to assist you, 24 hours a day, 7 days a week. To help reduce service emergencies, we offer service agreements to keep your comfort system running at peak performance. With a wide variety of products to choose from, we can keep you healthy and feeling comfortable all year long. We carry a complete line of energy efficient equipment with innovations that raise the standards of comfort and reliability. We offer our HVAC customers a total package. We are committed to providing our customers with the design, fabrication and installation of quality products with ON-TIME delivery. We have the capability to shear, break, and form 26 gauge thru 1/4" galvanized and carbon steel and 26 gauge thru 10 gauge stainless steel. Our team can provide design, fabrication and installation of ventilation and air conditioning duct for industrial and marine offshore customers. We specialize in shape cutting, press brake forming, and shearing, welding and custom assembly to customer's specifications. We can supply custom fabrication including sheet metal duct; both internal lined or wrapped and duct board, weather hoods and O/A stacks.